I get asked this a lot: "Why are you interested in Nazareth?" I also get asked: "Israel is a modern country; can't they look after their own hospitals?" Well, Nazareth is an important part of the story that made me who I am, and since nobody else is going to be me, and I'm not going to be anybody else either, that's why I'm going to tell you about Nazareth, and fight its corner. Having said all that, I would just like to gently point out that Nazareth can be part of YOUR story too, as you can be part of Nazareth's. A history stretching back over 2000 years is still being written, and although my part has been very small, it's still something that means a lot to me. Nazareth is now a fairly large town in northern Israel, and of course its most famous former resident was Jesus, which for many people is a big deal. It was for me too at one point, although I have a very different view of All That Stuff nowadays, and Nazareth played a large part in my current worldview. The people of the town and the surrounding region in the Lower Galilee are mainly Arab (Palestinian Israeli). Their ancestors have worked this land for millennia, genes flowing through bodies that have been Canaanites, Israelites, Assyrians, Jews, Greeks, Christians, Muslims, Druze and even quite a few of other and no religions. Whatever way you look at it, the Palestinian Israeli people of Nazareth are the closest living relatives of Jesus and his family. The Nazareth EMMS Hospital was founded by Dr PK Vartan in 1861, originally as a dispensing clinic. Vartan was the son of a poor Armenian tailor in Ottoman Constantinople, who ended up studying Medicine in Edinburgh and being sent by the Edinburgh Medical Missionary Society to deliver healthcare in Palestine. The "English Hospital" (how ironic!) 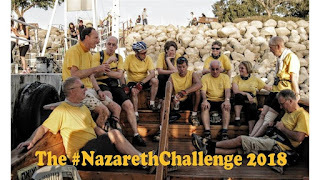 is now the largest employer in Nazareth itself, and although run by a Christian Trust (The Nazareth Trust), employs and treats Muslims, Christians, Jews and others without discrimination. It also provides outreach clinics in the West Bank and (on occasion) Gaza, and is the designated trauma centre for the Lower Galilee region. Being a predominantly Arab hospital, and given the way the Israeli health system works, it suffers from not having the large donor base of many of the large Israeli hospitals in the big cities. This is why the link with the UK is so important. We are trying to buy a CT scanner for the new Stroke Unit which will cater to a population of 250,000 people who really need it. This will make a big difference to the lives of people in the Lower Galilee. But Nazareth also affects us here, and personally I feel I need to give something back. As a medical student in 1993 I learnt a lot from the doctors, nurses, hospital staff and patients in Nazareth. They welcomed me into their homes. They allowed me to share their lives as much as their (amazing) food. When I go to Nazareth, I don't feel like a foreigner - I feel like I am coming to a second home. So that is why I am joining the Nazareth Challenge - cycling from Petra to Nazareth in March 2018. We aren't just getting a scanner - we are building and maintaining connections between a little part of the Middle East and the UK, and perhaps contributing towards peace and reconciliation in an area that needs it. Yes, there is a lot going on elsewhere in the world, and that is important too. We have to start somewhere. Can anything good come out of Nazareth? Yes it can. And what is good can come back. Here's to a magical, beautiful, friendly city and its wonderful people. See you soon, insh'allah. Please donate to the CT Scanner Appeal (yes, I am paying for my participation in the bike ride, so all your money goes to the appeal): http://justgiving.com/shanenaz - and spread the word. Maybe even join us (get in touch).